In the backdrop of the mysterious death of Paresh Mesta in Honnavara town of Karnataka’s Uttara Kannada district, members of Hindutva outfits have kept the district on a fore of communal violence. Rumours and lies around Mesta’s death that his dead body was found in a brutalised condition which later turned out to be false allegations which catalysed the situation. With Karnataka getting ready for assembly elections in coming May 2018, BJP leaders in the state have only intensified the tensed situation, perhaps for political purposes. 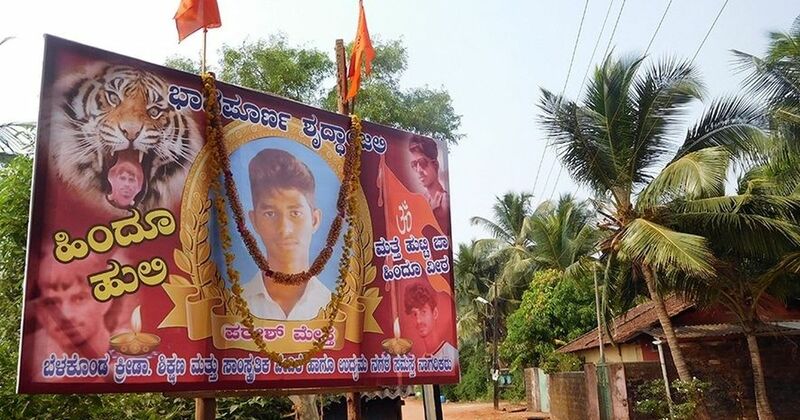 Though signs of normalcy are being established, however, posters terming Mesta as ‘Hindu tiger’, claiming him to be ‘Hindu Martyr’ have been put up by various groups in villages of Uttara Kannada. Image courtesy Scroll / A hoarding in Honnavara which says, "Hindu tiger, the Hindu martyr come alive again". It all started on December 1 in port town of Honnavara. On the occasion of Eid-Milad, some Muslim youth had unfurled a green flag at the Chandavar circle in the town. After which a number of Hindu youth reached the place and installed a pole with saffron flag there leading to clashes between the two groups in which at least five persons were injured. On December 6, the town witnessed another incident of a communal clash over an accident in which Paresh Mesta was allegedly also a part of it. Mesta went missing since then and his dead body was found floating in town’s Shetty Kere Lake on December 8. Rumours around Mesta’s death started circulating in social media groups and State BJP leaders were the forerunners in spreading them. The rumours of Mesta’s body being brutalised were turned down by the preliminary postmortem report, however, Hindutva outfits have resorted to communal violence across the district. Muslim communities have remained in a state of fear, locking themselves inside their houses. In order to bring in normalcy, Karnataka Police arrested about 160 persons allegedly belonging to Hindutva groups for taking part in riots across the district. In the recent riots t was reported that at least 50 persons were injured and properties belonging to Muslims were vandalised. BJP MPs from the state, Anant Kumar Hegde, and Shobha Karandlaje have reportedly made hate statements despite communal tensions. Karandlaje claimed Paresh Mesta to be a BJP activist and accused “Jihadists” to be responsible for Mesta’s death, however, it turned out that Mesta’s father denied any such Party affiliation of his son. Hegde, on the other hand, had earlier called for a ‘Jail Bharo’ from December 19, demanding the release of the persons arrested during riots. After some of the arrested people were released on December 15, hedge wrote a Facebook post threatening more violence . It said, “The chief minister should be ready for a bigger Marikamba Habba”, (Marikamba Habbais an annual event where animals are sacrificed near a temple). How did a region known for its secular values turn into a hotbed of communal politics in the state? Shivsundar, a longtime associate of Gauri Lankesh Patrike traced the history of communal violence in the state of Karnataka. According to him Uttara Kannada district transformed into such a site gradually, after a planned effort of Bharatiya Janata Party (BJP) and the Sangh Parivar. In 1985 Kolar witnessed communal tension after the decision of BJP and RSS to celebrate Ganesh Utsav in public in grand scale; in 1990 a riot broke out with the preparation for Eid-Milad celebrations in Kolar. BJP along with RSS did a door to door campaign and mobilised the locals and protested the Eid procession being carried out in Kolar. BJP and RSS sympathisers celebrated the laying of foundation stone of Ram temple in Ayodhya on 10 November 1989. This resulted in a series of riots in Arsikere, Hubli, and Dharwad. In 1990 the Rath Yatra of the BJP had again sparked a communal tension in the regions of the procession; this tension continued till1992 following the Babri Masjid demolition. In 1994, a dispute around an Urdu news channel broke out. The Kannada Para Sanghas (Kannada organisation) joined hands with the Hindu fundamentalist groups in the state and opposed the initiative. This again triggered communal tensions in the state. Shivsundar noted that since 2004, BJP has become stronger and in collaboration with RSS, has been trying to polarise the state. According to the database of communal violence in the state collated by Alternate Law Forum (ALF) in Bangalore, festivals and public gatherings have been the main sites of communal violence. Twenty four churches were vandalised under Yeddyurappa led BJP government, in 2008. Shivsundar also pointed out that, BJP and RSS had tried hard to communalise the Hyderabad-Karnataka regions but were unsuccessful. The syncretic nature of the region posed a serious challenge to their efforts to communalise the region; after which, they have occupied the Mumbai Karnataka region. Dakshina Kannada is also one of the regions that are now the soft targets of communal agenda of the BJP and RSS.